Getting people at the Auto Parts Show to come deep inside the large Motorcraft booth. Typically, trade show attendees scoot on by the edges and only a percentage actually make it inside where they can engage with booth staff and have their lead information recorded. Much of the booth preparations will go unnoticed unless attendees can be enticed to stop in. With a funny avatar building traffic, the rest of the booth staff can focus on their primary objectives and leave the business theater to CHOPS. Using CHOPS on a big screen on the aisle, along with a brand ambassador who could help attendees understand that CHOPS was fun and engaging, to get folks to stop long enough to hear him announce that there would be a fun contest and prizes inside during a short demonstration. Then CHOPS appears at a new location where the simple contest is held, and runs the contest and everyone celebrates the winner. The attendees are now inside the booth and sales staff can engage with them more easily. One of the biggest tradeshows in Las Vegas is the Automotive Aftermarket Products Expo (AAPEX) in November. 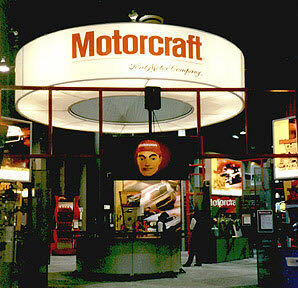 Motorcraft and Exhibitgroup/Giltspur booked CHOPS to increase booth traffic and brand awareness, solving several tradeshow problems at the same time. Being in more than one place at the same time is not only possible, it’s a real advantage for a virtual character trying to increase traffic at a tradeshow booth. The sales managers and marketing consultants at Motorcraft, Ford Motor Company’s automotive aftermarket division, learned this at the recent AAPEX conference held in Las Vegas. They placed two large video displays for CHOPS in the booth, one on the aisle and one deep inside their 50x70 ft. booth. And CHOPS could switch back and forth from his control room. Working with Gary at CHOPS was an absolutely positive experience. He kept his routine strictly within our corporate guidelines and was able to generate great attendee draw. Gary was also meticulous with his advanced show planning and studying the materials we supplied to him. Lastly, over a four-day show, it seemed like Gary worked the crowds seemingly without any major downtime. Great work ethic! Terrific results! 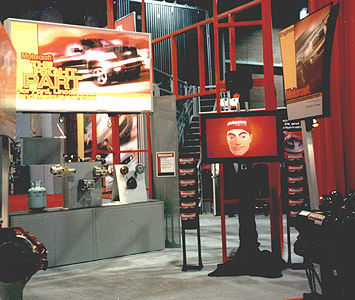 They hired pioneer performance animation artist Gary Jesch to perform as “Motorcraft Mike” in their 50x70 foot booth, alongside NASCAR Winston Cup driver Elliot Sadler. Jesch remained hidden in a storage closet the entire show, working from his Digital Puppeteer performance animation system, while Motorcraft Mike drummed up business on the aisle of the booth from his widescreen plasma display. Jesch has frequently served tradeshow exhibitors as a traffic builder, but this time the job had an unusual twist. Once Motorcraft Mike gathered 30-50 show attendees together, he then switched to another plasma screen 30 feet away in the booth, where he ran a simple contest and gave away prizes, twice an hour. With the help of a professional booth hostess, the entire group would move deep into the booth, where one attendee was asked to identify the “wrong” part on an engine display. When the person found the “wrong” part, he won an Elliot Sadler Motorcraft race team ball cap, and the rest of the group won matchbox-sized NASCAR race cars. Almost 1,000 matchbox cars were given away in the four days of the tradeshow. This concept was developed by Skip Lehman, of Mach2 Management, and Steve DeBano, of Ogilvy & Mather, who were hired by Motorcraft managers to deliver a crucial brand message. The exhibit builder was Exhibitgroup/Giltspur of Pittsburg, who has handled the Motorcraft account for several years, and they worked with their I&D division, ExpoServices to set up the booth. National Micro Rental provided the plasma screens. Jesch designed a way to deliver his digital puppet image to each location in the booth by switching the computer graphics and audio signal from his control booth. The high-res graphic of the character was then tweaked to fit the aspect ratio of the plasma screen during set-up. 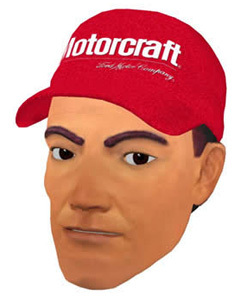 When Motorcraft Mike moved away from one location, his face was replaced by a graphic of the Motorcraft logo. “CHOPS Rule Number One says that just as soon as I take time off to go on break, the most important person we are trying to impress will walk up,” Jesch said. So his performance is non-stop (expect for a rare 5-minute break), as he talks with attendees and Motorcraft staff from the plasma screen. “Of course, I can see and talk with people who are far away from the booth, over at a distant aisle, and it takes a second for them to understand what’s going on. Then they come over and chat,” he explained. “It’s also kind of funny how people will stand at the edge of the booth, where the carpet changes color, before they come in.” He recommends that exhibitors who use his show install booth carpet the same color as the aisle carpet for better results. It’s human nature, he says, to treat the border like a fence and walk around the corner, instead of cutting through the open area of the booth. As competition for trade show attendees’ attention increases, this new technique of getting people into a large booth is a powerful traffic builder. While giving away free stuff is known for its ability to draw large crowds to an exhibitor’s booth, using CHOPS with two screens influences traffic flow, delivers the marketing message and qualifies attendees on the spot, breaking the ice for the sales staff. It also allows companies to control just how much “free stuff” is given away, and who gets it. Mach2’s director Skip Lehman said Jesch did a good job of dealing with the presentation challenge and is interested in trying it again at other tradeshows.